Next-Generation iPod Nano to Add Rear-Facing Camera? With the shift in form factor for the iPod nano at its latest update, a number of users were disappointed to see the camera that had been added in the fifth-generation model disappear. But if a new report from Taiwanese site Apple.pro [Google translation] is correct, the seventh-generation iPod nano presumably set for introduction later this year may retain its current smaller form factor but still add a rear-facing camera once again. 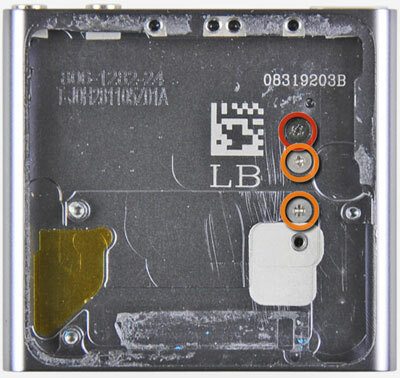 According to the report, a source in California sent the below photo claimed to be the rear case for the next-generation iPod nano, displaying what appears to be a camera hole in an upper corner. The report raises some question as to whether the photo could be an April Fools' joke, although the photo does at least appear genuine and is consistent with the casing of the sixth-generation model with the exception of the new camera hole. 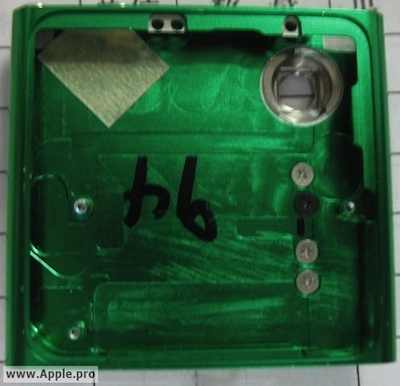 Based on the position of the hole, the camera would appear to take up space currently occupied by a portion of the iPod nano's battery, so it is unclear whether the device would be able to use a smaller battery or if components could be shifted around enough to accommodate the camera while maintaining the same size for the battery. Unaddressed is how the clip on the next-generation iPod nano would accommodate the rear-facing camera, as the clip is currently covers the entire back of the device and would of course obscure the camera. Based on the screws visible on the inside back of the case, however, it seems that Apple have simply narrowed the clip and perhaps shifted it down slightly from center in order to accommodate the camera. Finally, the report claims that the iPhone 5 will come in both black and white versions similar to the iPad 2. The iPhone 4 of course was introduced in both black and white models, but the white model has yet to begin shipping after several delays reportedly due to issues with light bleeding through the painted glass and affecting camera performance. Apple.pro has occasionally offered accurate information in the past, perhaps most notably with the posting of photos of a small touchscreen that appeared in the sixth-generation iPod nano a few months later.